It’s time to lace up and get ready! Races to be held at Botanical Gardens in Paget on Sunday, March 10th 2019. The first race starts at 1:00pm. Number pick-up, including late entries, is on Saturday, March 9th, 2019 at the National Sports Centre North Pavillion between 12:00pm and 2:00pm. An athlete’s age group is determined by their age on Sunday, March 10, 2019. Prizes will be awarded to the top three male and female runners of each age group. There will be one raffle draw prize for all participants. Participation medals will be awarded to all those who successfully complete the course. You must collect your number on Saturday, March 9th, 2019 to be eligible to run. No late entries will be accepted on Race Day. Parents are not permitted to run with their children. Races will have wave starts beginning with the 4 year old girls. Participants are advised to arrive a minimum of 30mins prior to their races on Race Day with their numbers already pinned on their shirts. Late arrivals will not be permitted to participate. All awards and prizes on Race Day are final and subject to the Race Director’s decision. Timing chips are incorporated in the race number that you will collect. It must be worn loosely on the front at belly button level. Results will be posted on www.bermudatiming.com. Prize presentations will take place after each age group has completed their race . Waiver statement: By participating in the 2019 KPMG Round the Grounds races, athletes agree to waive and release the BNAA, MAAC, Bermuda Timing Systems Ltd., KPMG, all sponsors or officials, employees or officers of the aforementioned from any and all claims arising from any injury or damages resulting from participation. 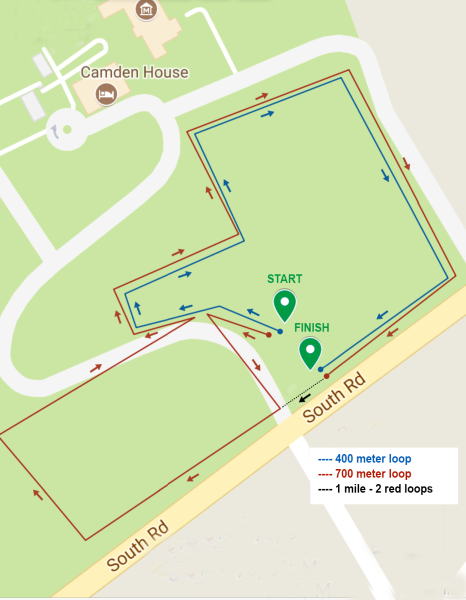 See Below for the Race Course Map.